"AIM7" redirects here. For the AIM7 systems benchmark, see AIM Multiuser Benchmark. "Sparrow missile" redirects here. For the Israeli ballistic target missile, see Sparrow (target missile). 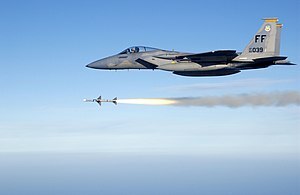 A U.S. Air Force F-15 Eagle fires an AIM-7 Sparrow missile in January 2005. The AIM-7 Sparrow is an American, medium-range semi-active radar homing air-to-air missile operated by the United States Air Force, United States Navy and United States Marine Corps, as well as various allied air forces and navies. Sparrow and its derivatives were the West's principal beyond visual range (BVR) air-to-air missile from the late 1950s until the 1990s. It remains in service, although it is being phased out in aviation applications in favor of the more advanced AIM-120 AMRAAM. The Self-Defence Forces of Japan also employ the Sparrow missile, though it is being phased out and replaced by the Mitsubishi AAM-4. NATO pilots use the brevity code Fox One in radio communication to signal launch of a Semi-Active Radar Homing Missile such as the Sparrow. The Sparrow was used as the basis for a surface-to-air missile, the RIM-7 Sea Sparrow, which is used by the United States Navy for air defense of its ships. The Sparrow emerged from a late-1940s United States Navy program to develop a guided rocket weapon for air-to-air use. In 1947 the Navy contracted Sperry to build a beam riding version of a standard 5-inch (127 mm) HVAR, the standard unguided aerial rocket, under Project Hotshot. The weapon was initially dubbed KAS-1, then AAM-2, and, from 1948 on, AAM-N-2. The airframe was developed by Douglas Aircraft Company. The diameter of the HVAR proved to be inadequate for the electronics, leading Douglas to expand the missile's airframe to 8-inch (203 mm) diameter. The prototype weapon began unpowered flight-tests in 1947, and made its first aerial interception in 1952. After a protracted development cycle the initial AAM-N-2 Sparrow entered limited operational service in 1954 with specially modified Skyknights all weather carrier night fighters. And in 1956, they were carried by the F3H-2M Demon and F7U Cutlass fighter aircraft. Compared to the modern versions, the Sparrow I was more streamlined and featured a bullet-shaped airframe with a long pointed nose. Sparrow I was a limited and rather primitive weapon. The limitations of beam-riding guidance (which was slaved to an optical sight on single seater fighters and a radar with night fighters) restricted the missile to attacks against targets flying a straight course and made it essentially useless against a maneuvering target. Only about 2,000 rounds were produced to this standard. As early as 1950 Douglas examined equipping the Sparrow with an active radar seeker, initially known as XAAM-N-2a Sparrow II, the original retroactively becoming Sparrow I. In 1952 it was given the new code AAM-N-3. The active radar made the Sparrow II a "fire and forget" weapon, allowing several to be fired at separate targets at the same time. By 1955 Douglas proposed going ahead with development, intending it to be the primary weapon for the F5D Skylancer interceptor. It was later selected, with some controversy, to be the primary weapon for the Canadian Avro Arrow supersonic interceptor, along with the new Astra fire-control system. For Canadian use and as a second source for US missiles, Canadair was selected to build the missiles in Quebec. The small size of the missile forebody and the K-band AN/APQ-64-radar limited performance, and it was never able to work in testing. After considerable development and test firings in the U.S. and Canada, Douglas abandoned development in 1956. Canadair continued development until the Arrow was cancelled in 1958. A subvariant of the Sparrow I armed with the same nuclear warhead as the MB-1 Genie was proposed in 1958, but was cancelled shortly thereafter. Concurrently with the development of the Sparrow I, in 1951, Raytheon began work on the semi-active radar homing version of Sparrow family of missiles, the AAM-N-6 Sparrow III. The first of these weapons entered United States Navy service in 1958. The AAM-N-6a was similar to the -6, but used a new Thiokol liquid-fuel rocket engine for improved performance. It also included changes to the guidance electronics to make it effective at higher closing speeds. The -6a was also selected to arm the Air Force's F-110A Spectre (F-4 Phantom) fighters in 1962, known to them as the AIM-101. It entered production in 1959, with 7500 being built. Another upgrade reverted to a Rocketdyne solid-fuel motor for the AAM-N-6b, which started production in 1963. The new motor significantly increased maximum range to 35 kilometres (22 mi) for head-on attacks. During this year the Navy and Air Force agreed on standardized naming conventions for their missiles. The Sparrows became the AIM-7 series. The original Sparrow I and aborted Sparrow II became the AIM-7A and AIM-7B, despite both being out of service. The -6, -6a and -6B became the AIM-7C, AIM-7D and AIM-7E respectively. 25,000 AIM-7Es were produced, and saw extensive use during the Vietnam War, where its performance was generally considered disappointing. The mixed results were a combination of reliability problems (exacerbated by the tropical climate), limited pilot training in fighter-to-fighter combat, and restrictive rules of engagement that generally prohibited BVR (beyond visual range) engagements. The Pk (kill probability) of the AIM-7E was less than 10%; US fighter pilots shot down 60[Note 1] aircraft out of the 612 Sparrows fired. In 1969 an improved version, the E-2, was introduced with clipped wings and various changes to the fuzing. Considered a "dogfight Sparrow", the AIM-7E-2 was intended to be used at shorter ranges where the missile was still travelling at high speeds, and in the head-on aspect, making it much more useful in the visual limitations imposed on the engagements. Even so, its kill rate was only 13% in combat, leading to a practice of ripple-firing all four at once in hopes of increasing kill probability. Its worst tendency was that of detonating prematurely, approximately a thousand feet in front of the launching aircraft, but it also had many motor failures, erratic flights, and fuzing problems. An E-3 version included additional changes to the fuzing, and an E-4 featured a modified seeker for use with the F-14 Tomcat. The most common version of the Sparrow today, the AIM-7M, entered service in 1982 and featured a new inverse monopulse seeker (matching the capabilities of Skyflash), active radar fuse, digital controls, improved ECM resistance, and better low-altitude performance. It was used to good advantage in the 1991 Gulf War, where it scored many USAF air-to-air kills; its kill probability, overall, is still less than 40%. The AIM-7P is similar in most ways to the M versions, and was primarily an upgrade program for existing M-series missiles. The main changes were to the software, improving low-level performance. A follow-on Block II upgrade added a new rear receiver allowing the missile to receive mid-course correction from the launching aircraft. Plans initially called for all M versions to be upgraded, but currently P's are being issued as required to replace M's lost or removed from the inventory. The final version of the missile was to have been the AIM-7R, which added an infrared seeker to an otherwise unchanged AIM-7P Block II. A general wind-down of the budget led to it being cancelled in 1997. Sparrow is now being phased out with the availability of the active-radar AIM-120 AMRAAM, but is likely to remain in service for several years. As part of the Avro Arrow program, Canadair partnered with Douglas in the development of the Sparrow II (AIM-7B). After Douglas dropped out of this program, Canadair continued on with it until the termination of the Arrow. The Italian company Finmeccanica, Alenia Difesa licensed the AIM-7E Sparrow technology from the US, and produced its own improved version called Aspide. British Aerospace (BAe) licensed the AIM-7E2 technology in the 1970s, producing the Skyflash missile. Skyflash used a Marconi XJ521 monopulse Semi-Active seeker together with improvements to the electronics. It was powered by the Aerojet Mk52 mod 2 rocket engine (later by the Rocketdyne Mk38 mod 4). Skyflash entered service with the Royal Air Force (RAF) on their Phantom FG.1/FGR.2 in 1976, and later on the Tornado F3. Skyflash was also exported to Sweden for use on their Viggen fighters. An upgraded version with active radar seeker, called Active Sky Flash was proposed by BAe and Thomson-CSF, but did not receive funding because the RAF opted for other missiles. The LY-60/FD-60/PL-10 is a family of PRC missiles developed by the Shanghai Academy of Science and Technology, largely based on the Italian Aspide missile - a version of the Sparrow. There are four versions of the basic design, three of which are surface-to-air and one air-to-air. The Sparrow has four major sections: guidance section, warhead, control, and rocket motor (currently the Hercules MK-58 solid-propellant rocket motor). It has a cylindrical body with four wings at mid-body and four tail fins. Although the external dimensions of the Sparrow remained relatively unchanged from model to model, the internal components of newer missiles represent major improvements, with vastly increased capabilities. The warhead is of the continuous-rod type. As with other semi-active radar guided missiles, the missile does not generate radar signals, but instead homes in on reflected continuous-wave signals from the launch platform's radar. The receiver also senses the guidance radar to enable comparisons that enhance the missile's resistance to passive jamming. The launching aircraft will illuminate the target with its radar. In radars of the 1950s these were single target tracking devices using a nutating horn as part of the antenna. This caused the beam to be swept in a small cone. Signal processing would be applied to determine the direction of maximum illumination and so develop a signal to steer the antenna toward the target. The missile detects the reflected signal from the target with a high gain antenna in a similar fashion and steers the entire missile toward closure with the target. The missile guidance also samples a portion of the illuminating signal via rearward pointing waveguides. The comparison of these two signals enabled logic circuits to determine the true target reflection signal, even if the target were to eject radar-reflecting chaff. ↑ 1.0 1.1 Directory of U.S. Military Rockets and Missiles: Raytheon AIM-7/RIM-7 Sparrow. Designation Systems. ↑ "Multi-service Air-Air, Air-Surface, Surface-Air brevity codes". Defense Technical Information Center (DTIC). 25 April 1997. p. 14. http://www.dtic.mil/doctrine/jel/service_pubs/lbrevity.pdf. Retrieved 12 April 2012. ↑ "Guided Missiles Ride Navy Jet." Popular Mechanics, November 1954, p. 116. Bonds, Ray and David Miller. "AIM-7 Sparrow". Illustrated Directory of Modern American Weapons. Zenith Imprint, 2002. ISBN 0-7603-1346-6 CITEREFBondsMiller2002. http://books.google.com/books?id=cfpBbuIlfV0C&printsec=frontcover&dq=Illustrated+Directory+of+Modern+American+Weapons#v=onepage&q&f=false. McCarthy Jr., Donald J. MiG Killers, A Chronology of U.S. Air Victories in Vietnam 1965-1973. 2009; Specialty Press, USA. ISBN 978-1-58007-136-9. Michel (III), Marshall L. (1997). Clashes: Air Combat Over North Vietnam, 1965-1972. US Naval Institute Press. ISBN 978-1-55750-585-9. Wikimedia Commons has media related to AIM-7 Sparrow. Wikimedia Commons has media related to RIM-7 Sea Sparrow.